Hi and welcome to “Lets Go Travel Australia” feel free to browse our site and read about travels around Australia. At this point in time Chris is still working full time so unfortunately we don’t get to travel as much as we would like to. Lake Wetherill at sunrise, in NSW. We have been camping, glamping and exploring different parts of our amazing country for a long time now. Mmmm must mean we are getting old 😛 . We both have a history of camping with our families, Kate even lived in a tent as her bedroom for over 12 months and the lounge room was also a tent. Not much fun when cows come and leave little presents in the lounge room though. She also travelled around with her parents putting up tents every night, camping started very young for Kate. 2013 we made it to the top of Australia. Chris also holidayed with his parents in their family caravan and he explored different parts of Australia on his own in his old Torana hatchback, bunking down in the back every night. When we got married we continued the camping tradition with our children. One of our trips up the Birdsville Track, Qld, in 2012. In our married life together our holidays have mostly been camping in one form or another. Over this time we have had several tents, 3 camping trailers and 3 caravans. So you could say camping/travelling is in our blood, we love to travel, explore new areas and get away from the hustle and bustle of life. We have experienced many amazing places together that you can read about on this site. Old Pajero and our 2nd camping trailer at Carnarvon Gorge, Qld. We also travel with our beautiful sometimes a little crazy labrador Jess. 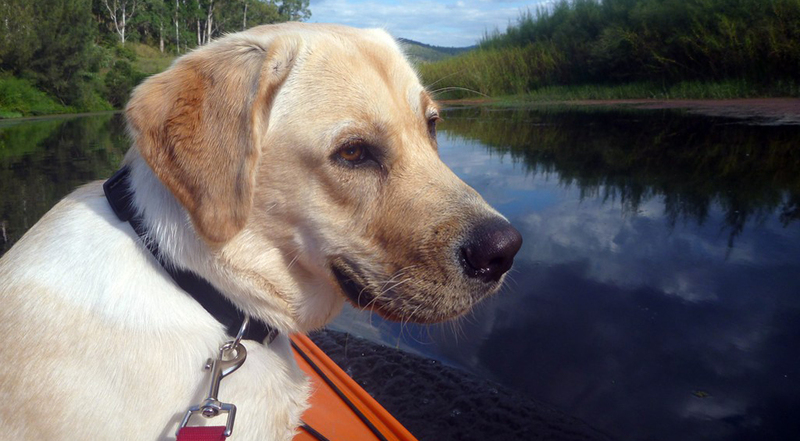 Jess loves to sit at the front of the Kayak and go for a paddle with us. We are both keen nature and landscape photographers. Kate has been involved in entering National and International Competitions and has photographic honours within Australian and with FIAP, (International Federation of Photographic Art). Elliot Falls, Jardine River National Park, Cape York, Qld. We initial set up this site up so friends and family could follow our travels, we have made this site public as some of the information might be helpful to other travellers. Just keep in mind the views expressed are our about our experiences about the places we have seen or been too, what it was when we were there, time of year, prices, drought etc all could have changed, the place might be presented completely differently for you. Our old Windsor van at the Painted Desert, South Australia. If you have any questions, or we can help with additional information feel free to contact us.